C1643. 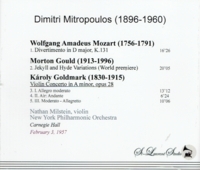 DIMITRI MITROPOULOS Cond. 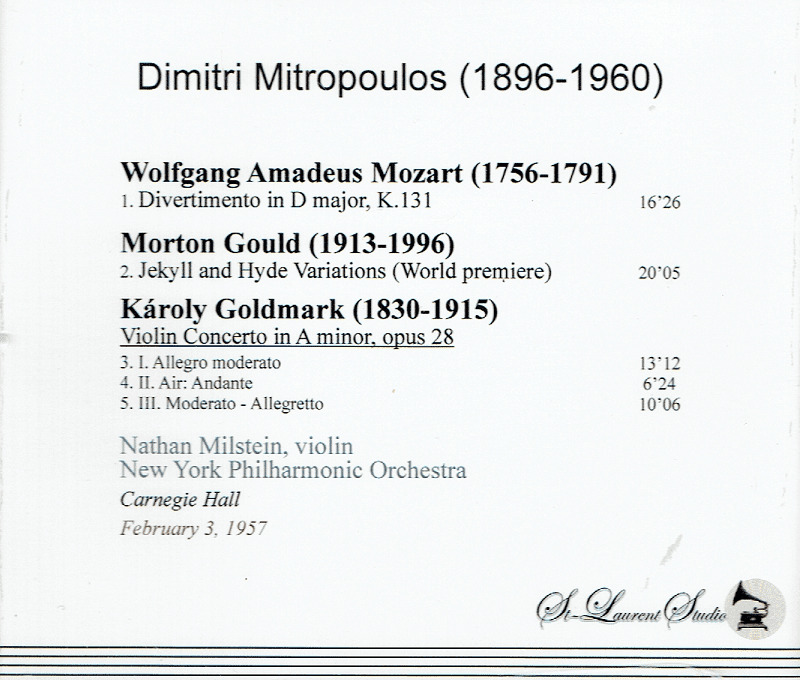 NYPO: Divertimento in D, K.131 (Mozart); Jekyll and Hyde Variations (Morton Gould - World Premiere); w. NATHAN MILSTEIN: Violin Concerto in a (Goldmark). 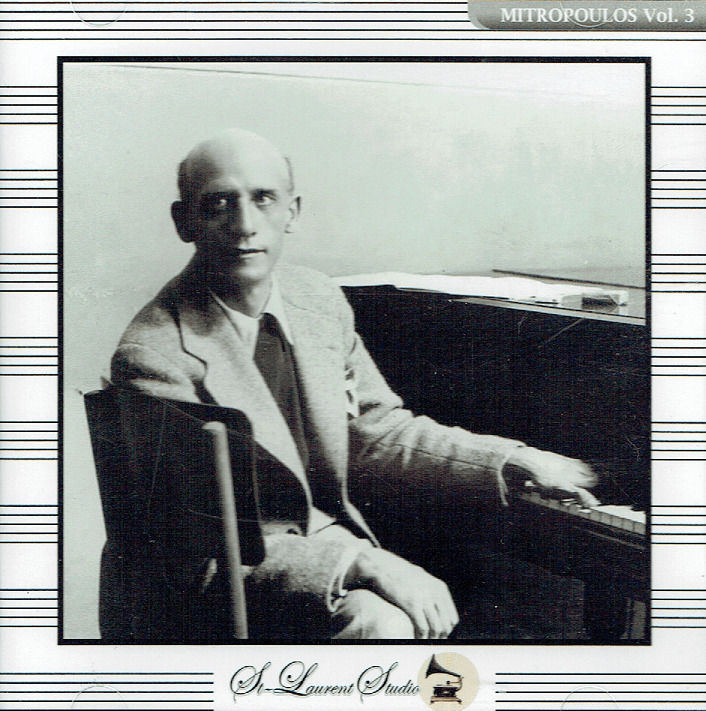 (Canada) St Laurent Studio YSL T-609, Live Performance, 3 Feb., 1957, Carnegie Hall. Transfers by Yves St Laurent. The Jekyll and Hyde Variations make a rare appearance. They owe their creation to Dmitri Mitropoulos, then conductor of the New York Philharmonic, who commissioned the piece. People said of Mitropoulos that he wasn't happy unless he could do something for you. What he did for Gould was take him seriously and insist on a work away from Gould's perceived populist, light-classics style. The composer gave him this set of, creepily enough, thirteen variations, written in dodecaphonic, serial – but not atonal – style. If someone hadn't told you, you probably wouldn't have known. Indeed, some of the variations sound almost like modal hymns. The basic theme is not a closed melody, as in Brahms' Haydn Variations, but a 'chain' of about seven pieces – strong, memorable gestures, really – which the composer often breaks up and rearranges, like differently colored beads on a string. The theme is also not the tone row, but one built from successive manipulations of the row. Thus, we get music that works closer to the ways traditional music has conditioned us to expect. Despite the title, Gould doesn't try to reproduce Stevenson's narrative. You could speculate why Gould chose the title at all....the composer gives us not only variations of individual brilliance, but that he has linked them all together to form a dramatic arc. The music becomes increasingly tortured, until the climatic twelfth variation – a symphonic scream – and then a contemplative thirteenth variation, functioning as an epilogue. Incidentally, the variations never really caught on with audiences or critics, so far out of Gould's perceived groove. But they did serve notice that Gould wouldn't be writing any more symphonettes. His late phase incorporated many of the post-war techniques, as well as the enormous influence of Charles Ives, allied to his Stravinskian base. Nevertheless, I consider the work one of his best: a marvelous score that deserves resurrection."